Sacred Wind Communications and its affiliate, Connect 66 Internet, have just provided their first 100 Mbps broadband service using their fixed wireless network to a customer in Juniper Hills, NM. Akin to breaking the sound barrier or Roger Bannister’s breaking the 4-minute mile in 1954, the reliable delivery of 100 Mbps Internet service to the home using a point to multipoint radio antenna is a new milestone for the company and for the industry. 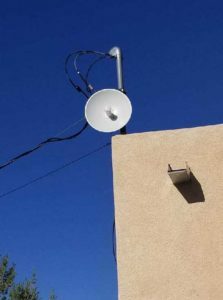 Sacred Wind has been operating a fixed wireless network to provide voice and broadband services to 3,200 square miles of Navajo Lands in New Mexico since 2009 – two years after its inception as an operating telecommunications carrier. In the last several years, the company has expanded its fixed wireless network to reach other unserved rural areas adjacent to its operating territory, including Grants, Milan, Bluewater Village, and now Juniper Hills. Fixed wireless networks provide broadband and voice telecommunications services for customers similar to mobile wireless networks, except that the service is “fixed” to the customer’s premise by way of an antenna attached to the structure. The service is therefore dedicated to a customer’s home or office and is more reliable.